Want a replenishing shampoo and natural hair treatment that gives you healthy, shiny hair? Looking to restore damaged hair, defriz or detangle, or deal with hair that’s unmanageable? McArthur Skincare's Pawpaw-based Replenishing Shampoo provides a shampoo containing natural ingredients that gently cleanses and replenishes providing healthy manageable hair. 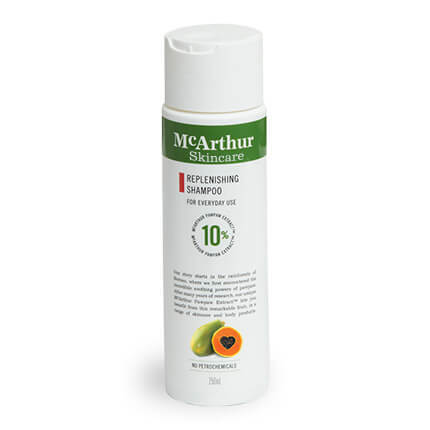 Containing 10% McArthur Pawpaw Extract™, this indulgent replenishing shampoo can aid in rehydrating and restoring the hair’s natural shine and beauty and is suitable for all hair types and everyday use. At McArthur Skincare, we are dedicated to helping you feel and look your best naturally. Our McArthur Pawpaw Extract™ harnesses the special properties of Pawpaw (Papaya, Papaw) in a concentrated form and is in all our hair care products. McArthur Skincare's Replenishing Shampoo uses natural active ingredients to help restore your hair. McArthur Pawpaw Extract™ is manufactured exclusively by us. Main active ingredient: Pawpaw (Papaya, Papaw). 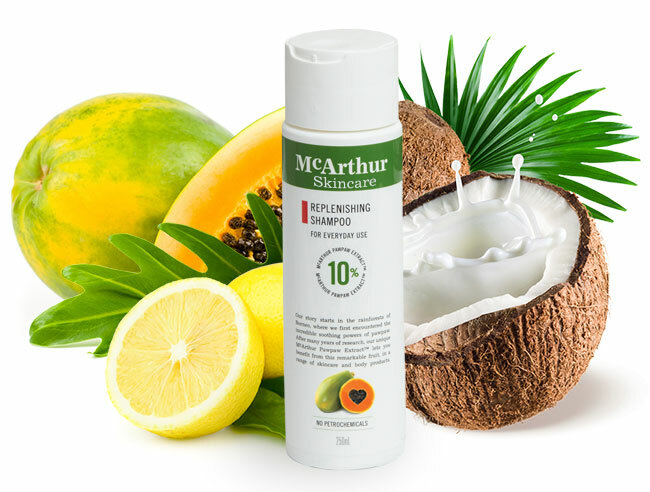 McArthur Skincare's Replenishing Shampoo also includes ingredients derived from Coconut and Citrus Fruits. At McArthur Skincare, our team is dedicated to creating products that use natural active ingredients. We stand by our products because we have seen the positive effects of their daily use. McArthur Skincare's Replenishing Shampoo has been formulated to help you manage difficult or damaged hair or hair that’s lacking natural shine. There’s no need to live with hair problems when you can use McArthur Skincare's Replenishing Shampoo to help manage, defrizz, untangle, and restore your hair to health and shine using a formulation which is based on natural ingredients. All products in the McArthur Skincare range are formulated with natural ingredients. Please keep McArthur Skincare's Replenishing Shampoo stored at a temperature that’s under 30° Celsius.